Survivors: Lystrosaurus, a relative to mammals, was one of a handful of “disaster taxa” to escape from the rubble of the Permian Period, along with the meter-high spore-tree Pleuromeia. Low diversity of animals delayed the full recovery of land ecosystems by millions of years. Researchers at Brown University and the University of Utah have concluded the mass extinction that ended the Permian Period was disastrous for land-based animals. In a specimen-by-specimen analysis, the scientists say species were reduced to a handful of forms, called disaster taxa. The low diversity of vertebrates meant that terrestrial ecosystems endured boom-and-bust cycles for up to 8 million years before finally stabilizing. Results appear in the journal Proceedings of the Royal Society B. In a paper published in the journal Proceedings of the Royal Society B, researchers at Brown University and the University of Utah undertook an exhaustive specimen-by-specimen analysis to confirm that land-based vertebrates suffered catastrophic losses as the Permian drew to a close. From the ashes, the survivors, a handful of genera labeled “disaster taxa,” were free to roam more or less unimpeded, with few competitors in their respective ecological niches. This lack of competition, the researchers write, caused vicious boom-and-bust cycles in the ecosystems, as external forces wreaked magnified havoc on the tenuous links in the food web. 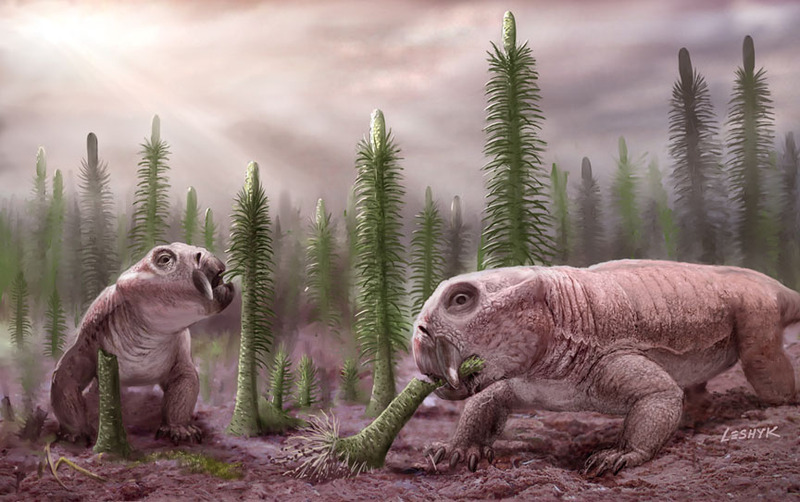 As a result, the scientists conclude from the fossil record that terrestrial ecosystems took up to 8 million years to rebound fully from the mass extinction through incremental evolution and speciation. Jessica Whiteside, collecting specimens at Ghost Ranch, N.M. A low diversity of species leads to boom-bust cycles in the food supply. “It means the (terrestrial ecosystems) were more subject to greater risk of collapse because there were fewer links” in the food web, said Jessica Whiteside, assistant professor of geological sciences at Brown and co-author on the paper. The boom-and-bust cycles that marked land-based ecosystems’ erratic rebound were like “mini-extinction events and recoveries,” said Randall Irmis, a co-author on the paper, who is a curator of paleontology at the Natural History Museum of Utah and an assistant professor of geology and geophysics at Utah. The hypothesis, in essence, places ecosystems’ recovery post-Permian squarely on the repopulation and diversification of species, rather than on an outside event, such as a smoothing out of climate. The analysis mirrors the conclusions reached by Whiteside in a paper published last year in Geology, in which she and a colleague argued that it took up to 10 million years after the end-Permian mass extinction for enough species to repopulate the ocean — restoring the food web — for the marine ecosystem to stabilize. “It really is the same pattern” with land-based ecosystems as marine environments, Whiteside said. The same seems to hold true for plants, she added. Some studies have argued that continued volcanism following the end-Permian extinction kept ecosystems’ recovery at bay, but Whiteside and Irmis say there’s no physical evidence of such activity. The researchers examined nearly 8,600 specimens, from near the end of the Permian to the middle Triassic, roughly 260 million to 242 million years ago. The fossils came from sites in the southern Ural Mountains of Russia and from the Karoo Basin in South Africa. The specimen count and analysis indicated that approximately 78 percent of land-based vertebrate genera perished in the end-Permian mass extinction. Out of the rubble emerged just a few species, the disaster taxa. One of these was Lystrosaurus, a dicynodont synapsid (related to mammals) about the size of a German shepherd. This creature barely registered during the Permian but dominated the ecosystem following the end-Permian extinction, the fossil record showed. Why Lystrosaurus survived the cataclysm when most others did not is a mystery, perhaps a combination of luck and not being picky about what it ate or where it lived. Similarly, a reptilian taxon, procolophonids, were mostly absent leading to the end-Permian extinction, yet exploded onto the scene afterward. “Comparison with previous food-web modeling studies suggests this low diversity and prevalence of just a few taxa meant that links in the food web were few, causing instability in the ecosystem and making it susceptible to boom-bust cycles and further extinction,” Whiteside said. “These results are consistent with the idea that the fluctuating carbon cycle reflects the unstable ecosystems in the aftermath of the extinction event,” Whiteside said. The National Science Foundation and the University of Utah funded the work. Reporters and the general public have free access to the manuscript through an award from the University of Utah J. Willard Marriott Library Open Access Publishing Fund.